Stretching nearly 20 feet wide by 8 feet tall, Mural (1943) is the largest work by Jackson Pollock (1912-1956). Beyond its monumental proportions and the many myths that surround its creation, the painting stands as one of the artist's greatest achievements. The iconic work will make its DC debut this fall through a special loan from the University of Iowa Museum of Art to the National Gallery of Art, Washington. On view in the Gallery's East Building from November 19, 2017, through October 28, 2018, the work will be accompanied by three paintings from different points in Pollock's career as well as a selection of works on paper. "As a seminal work of postwar abstraction, Jackson Pollock's Lavender Mist is one of the highlights of the Gallery's collection," said Earl A. Powell III, director, National Gallery of Art, Washington. "We are grateful to the University of Iowa Museum of Art for allowing our visitors to see such a significant precursor as Mural so that they may better understand the revolutionary artist's technical and stylistic evolution." Stenographic Figure to the gallery's Spring Salon for Young Artists. After seeing the work, jurors Piet Mondrian and Marcel Duchamp urged Guggenheim to take note of the promising young painter. Guggenheim offered Pollock a contract with her gallery, including a solo exhibition in November of that year and a commission to execute a site-specific painting for the entry hall of her townhouse. With Guggenheim's support of a monthly stipend, Pollock was able to quit his job as a custodian and focus on painting. 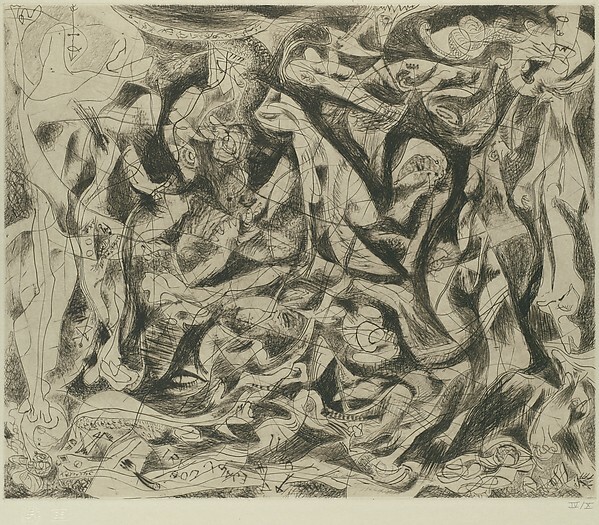 Soon after, Pollock began working on Mural, even tearing down a wall in his downtown apartment to make room for the enormous canvas.The only specifications Guggenheim gave the artist were the painting's size; the subject matter was up to Pollock, as was the technique. As he had not yet moved to working on the floor, Pollock stretched and hung the canvas on the wall. From this point, though, details on the artist's process for the work are sparse. 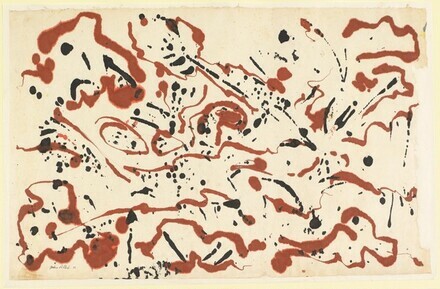 While some people, including Pollock's wife, Lee Krasner, claimed that Pollock painted Mural in one night, in a letter from 1944 Pollock simply said that he painted the work during the summer of 1943 (a fact which is supported by recent technical analysis of the work which shows that certain paints would have taken days to dry before Pollock applied more layers). 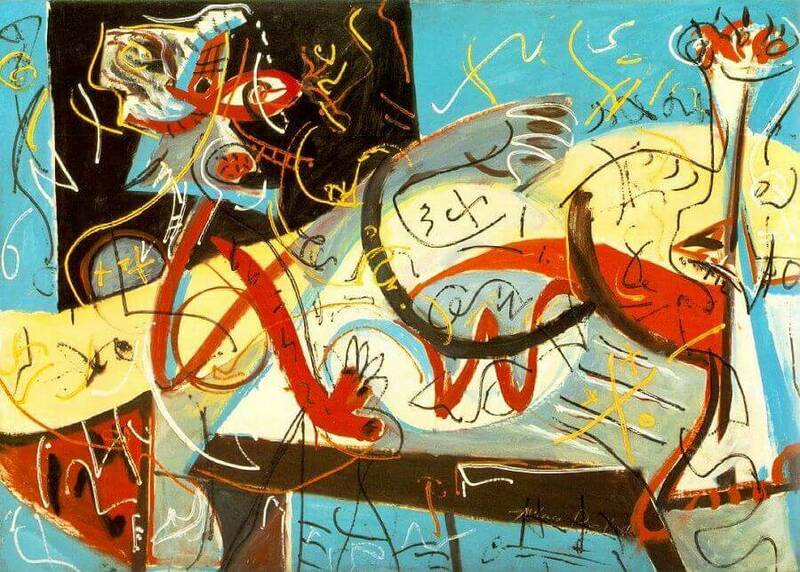 Once completed, the painting was a breakthrough for Pollock. It represents a major turning point in the painter's career and style, and brought him newfound recognition. Of seeing the work, critic Clement Greenberg later said, "I knew Jackson was the greatest painter this country had produced." When Guggenheim closed Art of This Century in 1947 and moved to Venice, she was unable to bring all of her collection with her. Mural remained in the States, on loan to Yale University before Guggenheim donated the work along with several others from her collection to the University of Iowa in 1951. Since then, the painting has remained in Iowa and rarely traveled. In 2008, floods severely damaged the Museum of Art, and while the collection was saved the Museum was forced to close. Mural was sent out on loan across Iowa to the Figge Art Museum and the Des Moines Art Center before traveling in 2012 to the Getty Conservation Institute for two years of analysis. At the Getty, Mural was cleaned, a layer of discolored varnish from 1973 was removed, and the canvas was restretched to address sagging. The work's time at the Getty also allowed for extensive study and research by a range of experts led by Getty conservators and scientists and including Jay Krueger, the National Gallery of Art's head of painting conservation, and John Delaney, the National Gallery of Art's senior imaging scientist. Analysis confirmed that the entire painting was not made in one night, as indicated by layers of wet paint on top of dry paint. However, examination of the primary layers of paint showed wet paint applied on wet paint, perhaps indicating that Pollock painted the base of four colors (lemon yellow, dark teal, red, and dark brown) overnight. Following the study and treatment of Mural, the painting embarked on a five-city international tour with stops including the Peggy Guggenheim Collection in Venice and the Guggenheim Museum in Bilbao. Now, before finally returning to Iowa, Mural makes two stops in the US in addition to the Gallery—the Nelson-Atkins Museum of Art in Kansas City, Missouri (where it was on view from July to October of this year), and the Columbia Museum of Art in Columbia, South Carolina (November 2018 to May 2019). The presentation of Mural at the Gallery will mark the first time the painting has been on view in Washington, and its first time on the East Coast in more than 15 years. and Ritual (1953), on loan from the Robert and Jane Meyerhoff Collection. 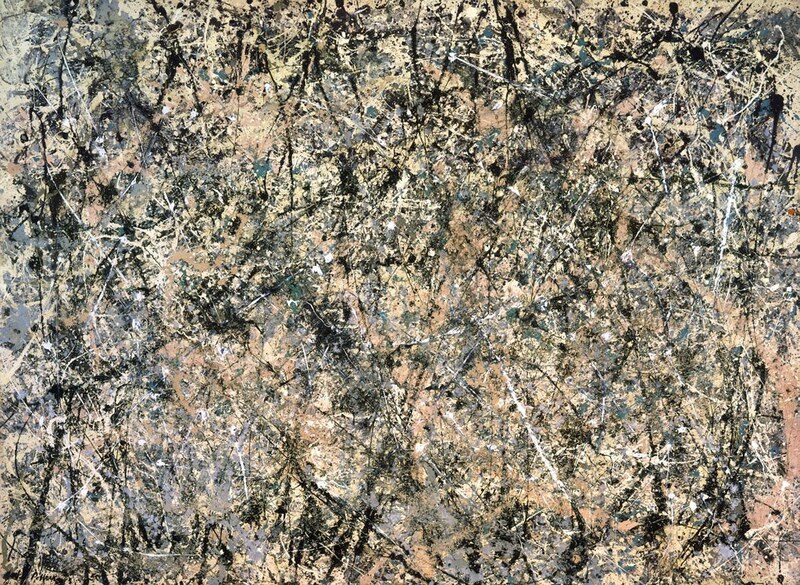 Lavender Mist was painted in Pollock's studio on Long Island when he had transitioned to his signature technique of pouring, flinging, and dripping paint onto unstretched canvas laid on the floor. 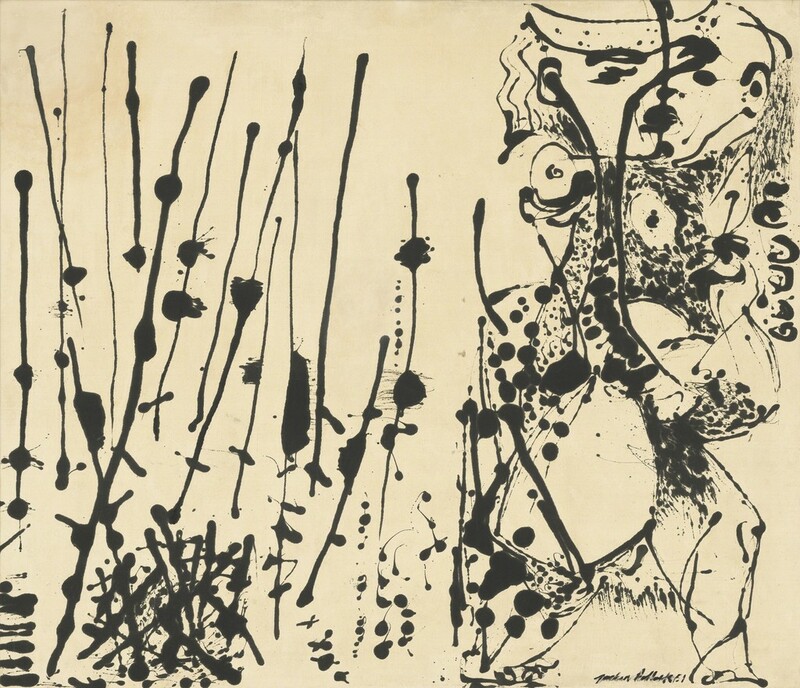 Number 7 represents a shift in Pollock's style: rather than dripping, the artist used turkey basters to apply black paint in both abstract and figural forms. Finally, Ritual comes toward the end of the painter's career, when he returned to painting on stretched canvas with a brush, as he had for Mural. An additional 10 works on paper included in the installation (shown in two rotations of five works each) provide a broader perspective on Pollock's career and highlight the Gallery's collection of works on paper by the artist.